SAN FRANCISCO Yahoo (YHOO) CEO Marissa Mayer turned in an encouraging report card covering her first few months running the troubled Internet company. The third-quarter results announced Monday weren't astounding, but they were better than analysts anticipated. Most importantly, Yahoo's net revenue crept up from the previous year for the third consecutive year. That reinforced the belief that things are finally getting better at Yahoo after five years of financial malaise, especially with the hard-driving, well-respected Mayer at the helm. Mayer, 37, underscored her determination to turn around Yahoo by returning to work just a few weeks after having her first baby. Mayer's son was born on Sept. 30, the final day of the third quarter. Monday's review of the results provided Mayer with her first opportunity to publicly share her vision for Yahoo Inc. The company, which is based in Sunnyvale, Calif., lured Mayer away from rival Google Inc. in mid-July. Without providing specifics, Mayer said that she plans to ensure that Yahoo's services become a "daily habit" for its 700 million users. Toward that end, she wants to improve Yahoo's search engine and email service and indicated that the home page of the company's website will get a makeover. She also pledged to pour more resources into developing services for smartphones and tablet computers. Bolstering Yahoo's product line-up through acquisitions is also on her agenda, she said, although she emphasized that most of the deals she has in mind would target relatively small startups willing to sell for less than $100 million. "Our products will change how people learn, share and communicate," Mayer said. "We will inspire, innovate and entertain." 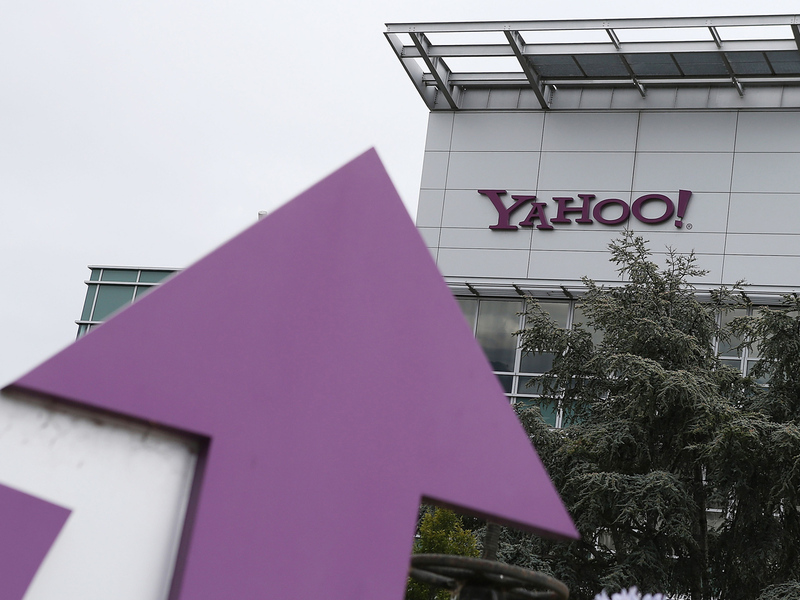 Yahoo shares in after-hours trading rose nearly 5 percent, or 75 cents per share, to $16.52. If the shares hit that price in Tuesday's regular session, it will be the highest level that the stock has reached since Mayer's arrival. Yahoo earned $3.2 billion, or $2.64 per share, during the three months that ended in September. Most of that profit stemmed from a one-time gain of $2.8 billion that Yahoo pocketed by selling half its stake in Alibaba Group, one of China's most successful Internet companies. Yahoo earned $293 million, or 23 cents per share, at the same time last year. If not for the Alibaba windfall and a restructuring charge, Yahoo said it would have earned 35 cents per share. On that basis, the company easily topped the average earnings estimate of 26 cents per share among analysts surveyed by FactSet. The earnings included a $135 million benefit from a lower tax rate. The Alibaba sale left Yahoo with $9.4 billion in cash at the end of September. The company already has earmarked $2.5 billion of the money to pay taxes in the fourth quarter and expects to spend another $3 billion buying back its own stock in an attempt to boost the price. Yahoo's revenue for the third quarter totaled $1.2 billion, a 1 percent dip from last year. That comparison is misleading, though, because last year's revenue included money that Yahoo no longer books because of an Internet search advertising partnership that diverts some of its ad sales to Microsoft (MSFT). Wall Street focuses on net revenue -- the amount of money that Yahoo keeps after paying its commission to Microsoft and other sites that run its ads. Net revenue in the latest quarter rose 2 percent to $1.09 billion. That was about $10 million more than analysts had predicted. Though modest, the revenue growth is a positive sign after years of steady declines. Net revenue also crept up slightly from the previous year in each of the previous two quarters while Yahoo was being run by other CEOs. The company has gone through five full-time and interim CEOs since it squandered an opportunity to sell itself to Microsoft for $33 per share in May 2008. Yahoo's struggles since then have exasperated investors because the company makes most of its money from advertising, and marketers have been pouring more into the Internet. Most of those dollars, though, have been flowing to Google, the Internet's search leader, and Facebook Inc., the Internet's social networking leader. Mayer was one of Google's top executives for 13 years before defecting to Yahoo for a compensation package valued at $59 million. Even though its third-quarter results disappointed investors last week, Google is still growing at a far faster clip than Yahoo. In the third quarter, Google's net ad revenue rose by 14 percent from last year. Facebook is scheduled to release its third-quarter results Tuesday. Mayer envisions Yahoo's ad revenue increasing at a faster clip than the overall industry, although she said that it may take several years to achieve that goal. "This job is tailor made for me," Mayer assured analysts Monday. She added: "Our goals are simple. Execute faster, return value to our shareholders, attract the best talent, and make Yahoo the absolute best place to work."